A free market is a type of economic system that is controlled by the market forces of supply and demandSupply and DemandThe laws of supply and demand are microeconomic concepts that state that in efficient markets, the quantity supplied of a good and quantity demanded of that as opposed to government controls that involve price-cutting monopolies. It is different from a regulated market or command economy. In the latter, a central government agency decides the supply and demand, which means the market does not operate freely. In a free market, a majority of companies and properties are owned by individuals or entities in the private sector instead of the state. Economists define a free market as one where products are exchanged by a willing buyer and seller. Purchasing groceries at a given price set by the farm grower is a good example of economic exchange. Paying a worker a monthly salaryRemunerationRemuneration is any type of compensation or payment that an individual or employee receives as payment for their services or the work that they do for an organization or company. It includes whatever base salary an employee receives, along with other types of payment that accrue during the course of their work, which is another instance where an economic exchange happens. In a free or pure market economy, sellers of different goods don’t face any barriers. Essentially, one can sell any product they wish to sell and at any price. However, in the real world, such a kind of economic system rarely exists. TariffsTariffA tariff is a form of tax imposed on imported goods or services. Tariffs are the common element in international trading. The primary goals of imposing imposed on imports and exports and legal restrictions such as the age restriction on alcoholic beverages are all barriers to a free market. Overall, capitalist economiesCapitalismCapitalism is an economic system that allows for and encourages the private ownership of businesses that operate to generate profit. Also known as the market system, capitalism is characterized by private land ownership rights, competitive markets, the stable rule of law, freely operating capital markets, low, which are practiced by most democracies, including the United States, are free only because ownership belongs to a few individuals as opposed to the government. Free economies exist because a significant portion of resources is owned by individuals or companies in the private sector and not a central government agency. In this way, the owners exercise total control over the means of production, allocation, and exchange of products. They also control the labor supply. One key factor that helps a free market economy to be successful is the presence of financial institutions. Banks and brokerages exist so that they give individuals and companies the means to exchange goods and services. The financial institutions then make a profit by charging interest or fees on transactions. Another characteristic of a free market economy is that any one individual can take part in it. The decision to produce or consume a particular product is totally voluntary. It means that companies or individuals can produce as much or as little of a product as they want. The absence of governmental influence allows companies a wide range of freedom. In a free market economy, business owners enjoy all the freedom to come up with new ideas based on the consumers’ needs. They can create new products and offer new services at any time they want to. As such, entrepreneurs rarely rely on government agencies to notify them of consumers’ needs. The entrepreneurs do their own research and identify popular trends. The innovation among different private companies can lead to competition as every company tries to improve on the features of its product to make it better. With a free market economic system, it is the consumers who decide which products become a success and which ones fail. When presented with two options of products, the consumer evaluates the features of each and goes for the one that offers better value for money. To a great extent, the consumer also influences the price set on a product. As such, producers need to strike a balance between that price point that earns them a profit but is still affordable by the average customer. One disadvantage of a free market economy is that some producers are driven exclusively by their profit motives. Even though the primary goal of any business is to generate profit, such an objective should not be prioritized over the needs of workers and consumers. Put simply, a company should never compromise the safety of its workers or disregard environmental standards and ethical conduct just so it can make supernormal profits. An example took place in the early 2000s, a time when unethical behavior became prevalent among companies such as WorldCom and Enron. In 2010, the Deepwater Horizon oil spill, which is one of the biggest environmental disasters in the United States, happened because the company used substandard cement and other cost-reducing measures. At times, a free market economy can spin out of control, causing dire consequences. Good examples of market failure include the Great DepressionThe Great DepressionThe Great Depression was a worldwide economic depression that took place from the late 1920s to the early 1930s. For decades debates have been going on abou of the 1930s and the real estate market crash that happened in 2008. Market failures can lead to devastating outcomes such as unemployment, homelessness, and lost income. 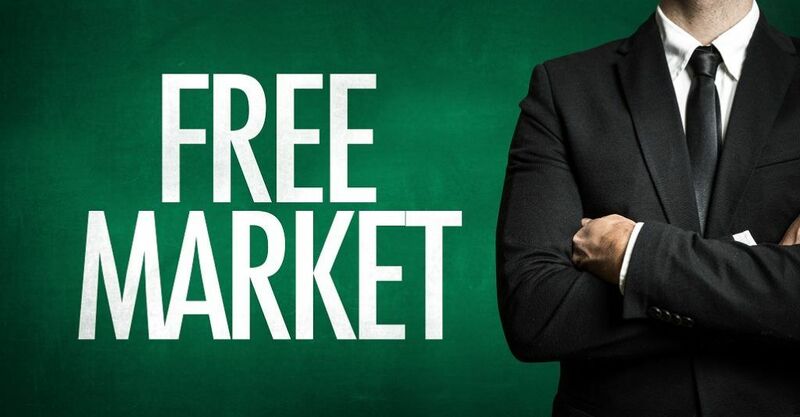 A free market is a self-regulated economy that runs on the basis of demand and supply. In a truly free market, the central government agency does not regulate any aspect of the economy. By removing government regulations, the nature of the free market forces businesses to provide superior products and services that address consumers’ needs. A free market economic system also helps sellers to create affordable prices for everyone.